Above: The welcome sign at GCU. Grand Canyon University (GCU) is one of the most frequently searched colleges in America, according to a recent internet keyword search of United States colleges and universities. GCU is a Christian, for-profit research university located in Phoenix, Arizona. The school was established in 1949 as a non profit, and became a profit making entity in 2004. The school currently maintains an enrollment of more than 20,000 students on campus, and more than 60,000 students online. The acceptance rate at GCU is around 60 percent. Notable GCU alumni include many professional baseball players, basketball players, and mixed martial artists, among others. GCU is accredited by the Higher Learning Commission (HLC), and licensed by the Arizona State Board for Private Postsecondary Education. Programs at the College of Nursing and Health Care Professions of GCU are accredited by the Commission on Collegiate Nursing Education (CCNE) and are approved by the Arizona State Board of Nursing. Above: The GCU Arena, a 135,000-square-foot, multi purpose entertainment and athletic facility that seats 5,000 people. Here are the answers to some of the most frequently asked questions about GCU. 1. Where is Grand Canyon University? 2. What types of degrees are offered at Grand Canyon University? GCU offers Bachelors, Masters, and Doctoral degree programs in many fascinating fields of study. 3. What courses and programs are offered at Grand Canyon University? 4. Who should attend Grand Canyon University? GCU is an excellent choice for anyone who lives (or wants to live) in the greater Phoenix area, or anyone who wants to take the online classes offered by GCU. High school students, active military members, and the spouses of active military members are offered special discounts on tuition. 5. Why attend Grand Canyon University? GCU has many academic and professional programs to choose from. GCU features a dual enrollment program for ambitious high school students. GCU offers a wealth of online programs. 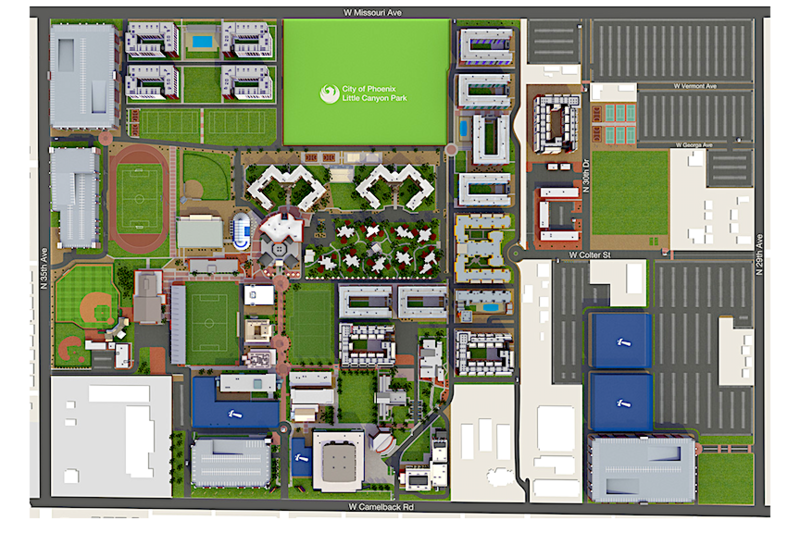 The GCU campus is ideally situated in the heart of the city of Phoenix. 6. How much does it cost to enroll at Grand Canyon University? $687.50 per credit for 1 to 11 credits, for all students. $8,250 per semester for all students who take 12 to 18 credits. $310 per credit for summer classes, for all students. $210 per 4-credit course ($52.50 per credit) for dual enrollments with local high schools. Additional fees may also apply, such as application fees, registration fees, parking fees, technology fees, insurance fees, and online course fees, to name a few. Some students must also factor housing and meal costs into the equation. 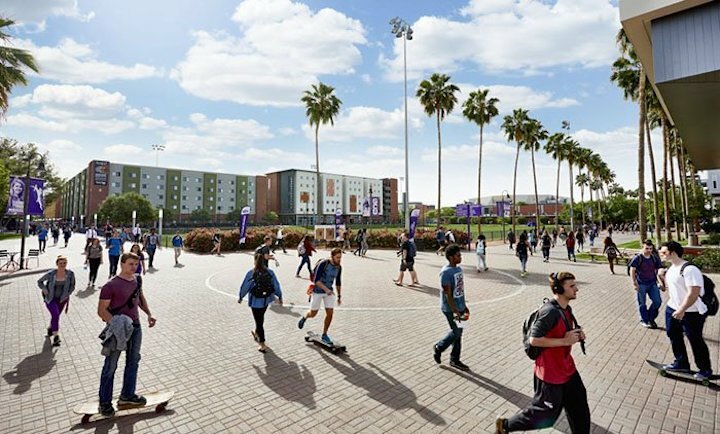 Financial aid may be available in the form of scholarships, grants, loans, and/or work study programs, to help students pay for their educations at GCU. The average GCU student pays only about $8,600 per year after financial aid kicks in. 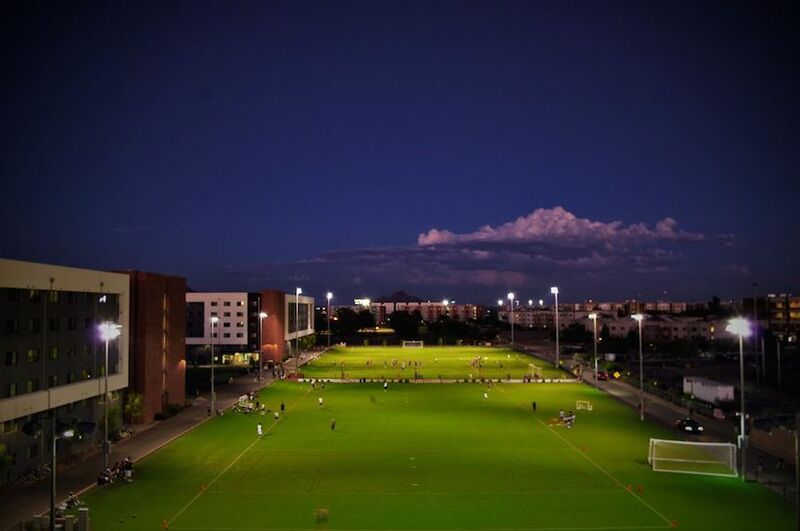 Shown above: A sports field at GCU known as The Grove. 7. How long does it take to earn a degree from Grand Canyon University? For a full time student at GCU, it should take about four years to earn a Bachelor's degree, and can take six years or longer to attain higher degrees. 8. What is the Grand Canyon University campus like? The campus of GCU occupies an urban setting and features sleek modern architecture. On-campus amenities include a bookstore, a Starbucks, and a collection of eateries called Thunder Alley. Other campus attractions include parks, playing fields, a beautiful golf course, and the GCU Arena pictured above. The school colors are purple, black, and white. The intercollegiate sports teams at GCU are called the Antelopes. GCU is the first and only for-profit institution whose athletic teams play in Division 1 of the NCAA. They also participate in the Western Athletic Conference. Varsity sports for men and women include Baseball, Basketball, and Volleyball. GCU also features intramural club sports such as Lacrosse and Rugby. Other on-campus student activities include a school newspaper called GCU Today. 9. What is the Grand Canyon University campus neighborhood like? 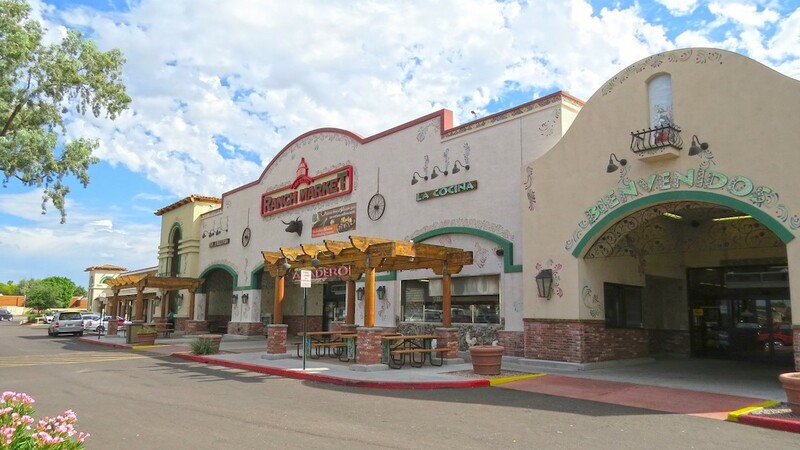 The GCU campus is located just 2 blocks east of numerous conveniences such as markets, pharmacies, and banks, as well as many affordable places to eat. As for public transportation, the 50 bus runs along Camelback Road, and connects with other buses. A car is more of a luxury than a necessity around here. Above: A shopping center near GCU. 10. 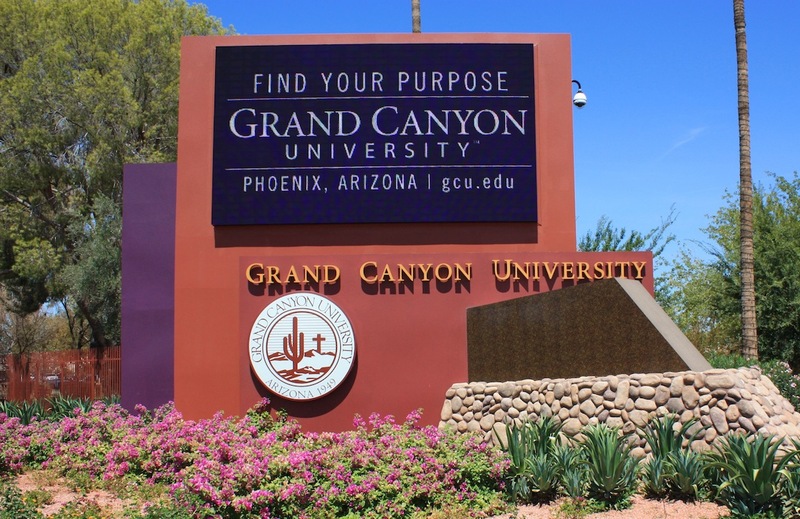 What are the distance learning options at Grand Canyon University? You might also check out GCU's individual online courses and online continuing education programs. GCU has been recognized as a top-five online school for entrepreneurs by Fortune Magazine. 11. What is the contact information for Grand Canyon University? For general questions pertaining to GCU, call 602-639-7500. To contact someone at the main campus of GCU, call 855-GCU-LOPE. To reach the housing office, call 602-639-6240.